Behind every man, there's a great woman. 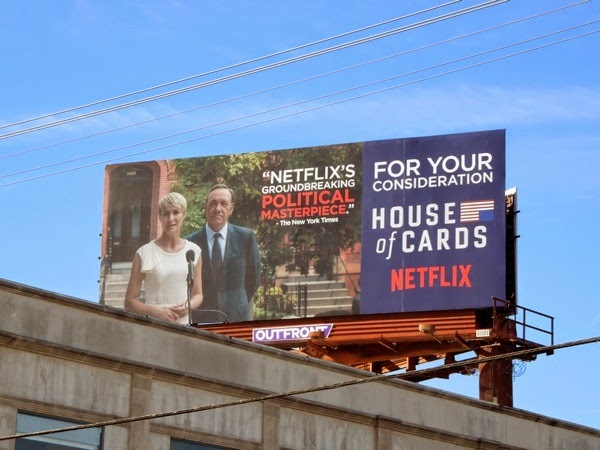 House of Cards has obviously taken that old adage to heart for its second season ad creative, as Golden Globe winner Robin Wright joins Kevin Spacey in the power spotlight. 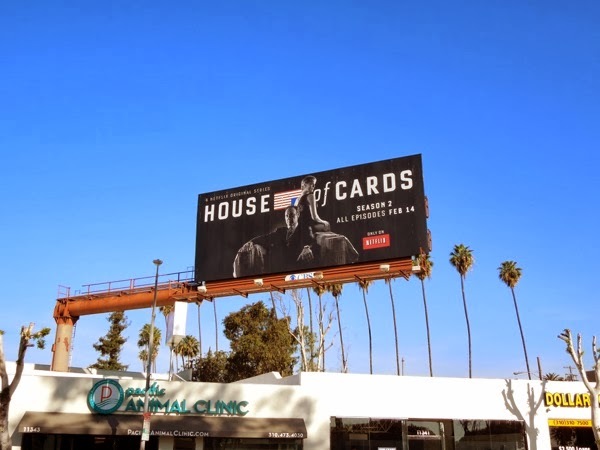 Netflix critically-acclaimed hit series arrived to much fanfare last year, but Daily Billboard hasn't seen the same level of out-of-home ad support for the show this season (maybe because the runaway success doesn't need it). Nominated for numerous awards for its actors, directors and production staff, this political drama following the exploits of a conniving U.S. Congressman and his equally scheming wife seeking revenge, seems to have captured audiences imagination. The series which heralded the advent of a new generation TV binge-viewing, providing a full season on the same day, delivers the dramatic goods for its sophomore season as it continues to nip at the heels of the established networks and their formulaic shows. 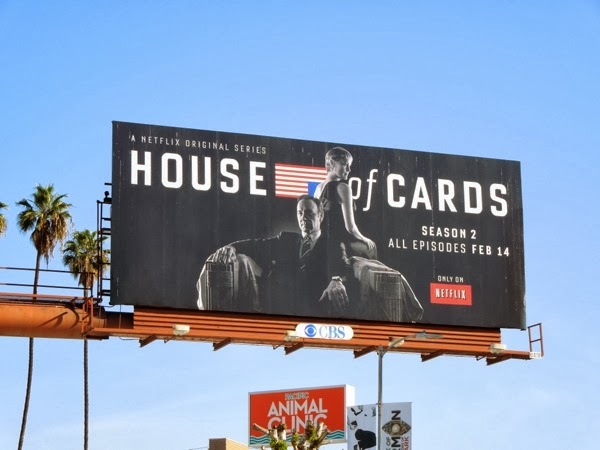 These House of Cards season two billboards were spotted along the Sunset Strip on February 5, plus along Santa Monica Boulevard in West L.A. on February 14, 2014. 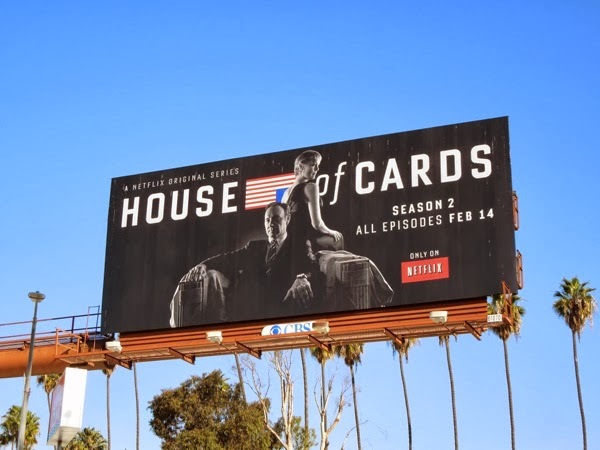 Daily Billboard always loves when a show had a real identity for its seasonal promo billboards and when it evolves that design from season to season. 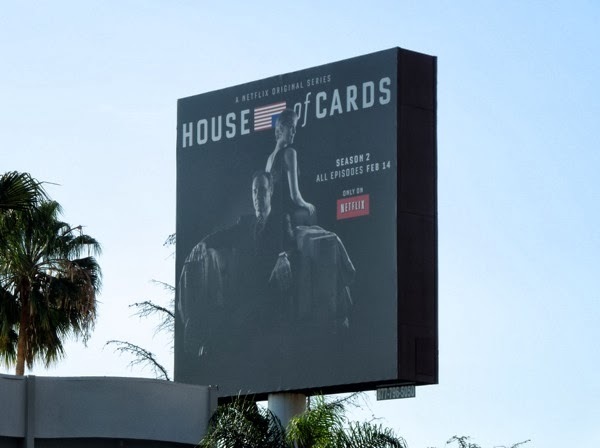 Be sure to check out House of Cards series launch billboards from around this time last year to compare the two seasons creatives. 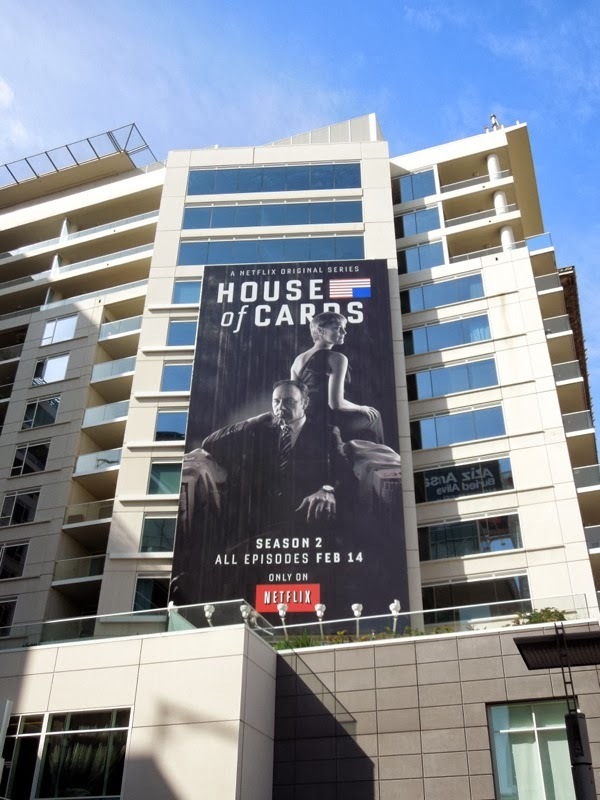 UPDATED: Here's another format of the season two billboard spied at the W Hotel in Hollywood on March 5, 2014. 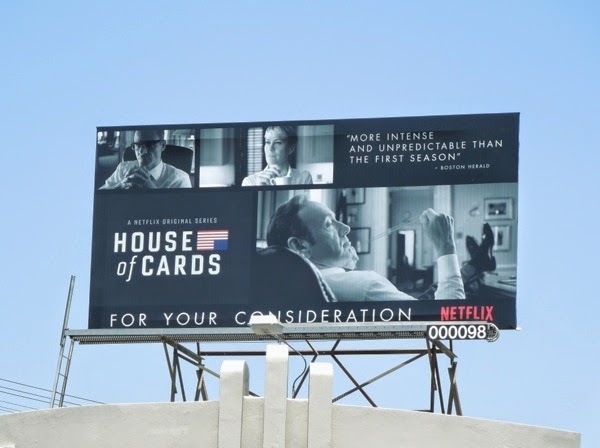 UPDATED: Following another staggering season for House of Cards, here are two 2014 Emmy Consideration billboards for the scheming Netflix show. 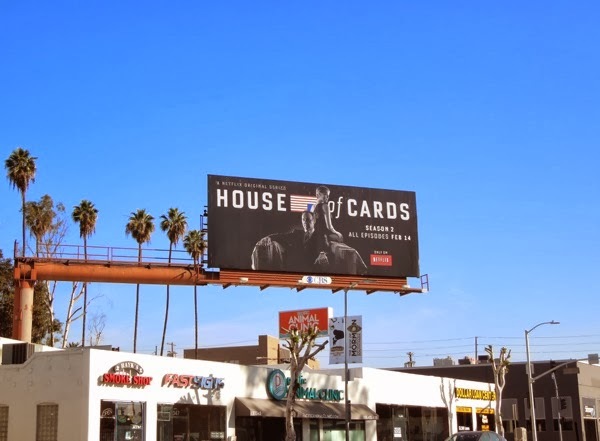 The smaller montage billboard was spied first along Beverly Boulevard on May 28, whilst the larger landscape version was spotted along L.A.'s Sunset Strip on May 30, 2014. Let's hope the stellar show and cast can add some Emmys to their accolades as well as Golden Globes this year. UPDATED: As 2014 draws to a close, another awards season is on the horizon and Netflix is supporting its original shows in the hopes of scoring a Golden Globe or SAG Award. 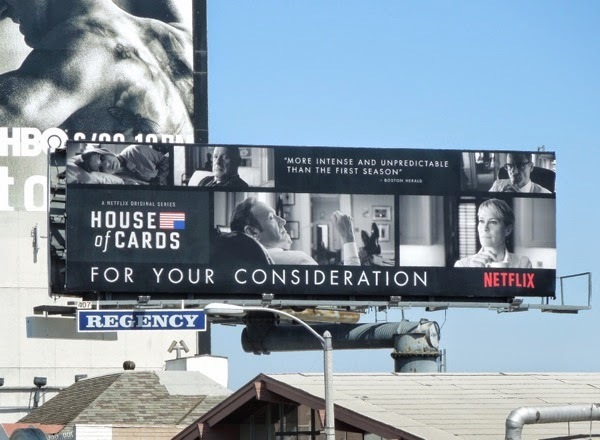 This For Your Consideration billboard for the second season of the highly acclaimed House of Cards was snapped along Beverly Boulevard on November 27, 2014.